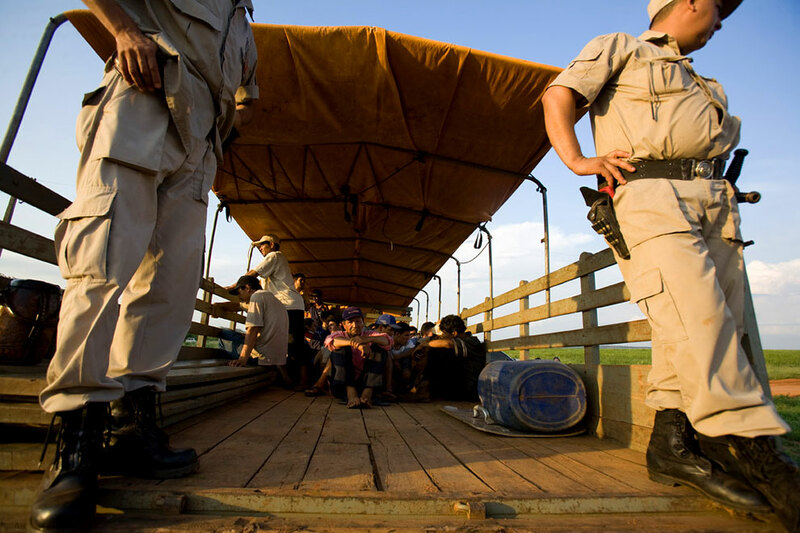 San Marcos, San Vicente district, San Pedro--October 27, 2008--Farmers are detained by national police after a court-ordered eviction of a landless settlement on the property of a Brazilian genetically modified soybean producer. Land invasions on the part of peasant groups generally have an ecological character: landless farmers not only demand land to work, but are also protesting against the widespread deforestation, and the use of agrochemicals on the part of the transnational soy producers that dominate the tropical countryside. People living in the countryside face indiscriminate spraying of pesticides by soy producers. Farmers describe the days following a fumigation: headaches, nausea and skin rashes, problems seeing and respiratory infections. It is common for their chickens to die, and for the cows to abort their calves and their milk to dry up. The non-soy crops they produce for their own consumption also perish.